Two years ago around Halloween time, I discovered Tam Lin – the Scottish ballad most famously re-told by the 60’s British folk rock band Fairport Convention. I became mildly obsessed. I imagined some kind of mystical affinity with the story, across the ages and the continents. This Halloween, I’m reflecting on what it is that captivated me so about the fairy tale. Well, if that be so … myself shall bear the blame. There’s not a knight in all your hall, shall get the baby’s name. I’d not change my own true love, for any knight you have. Now Janet again rides to Carterhaugh, and –depending upon the version you read— either seeks Tam Lin directly, or searches for an abortificent herb. Either way, Tam Lin again appears, and Janet poses the central question: Who are you? He explains that he was captured by the fairies, imprisoned in the wood. He fears that the fairy queen will soon sacrifice him as a tithe to Hell. Yet there is one, exceedingly challenging way out, and it falls upon Janet to execute it. On the night of Halloween, the entire fairy troop will ride. 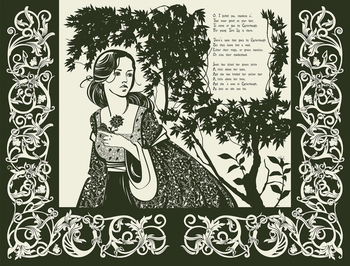 “Those that would their true love win, at Miles Cross they must hide.” Janet’s task is to pull Tam Lin from his horse, and then –the heart of the story— hold him, never dropping him, as the fairies turn him from one fearsome creature to another –a lion bold, a serpent, a burning rod of lead– until finally, he is re-born a “naked knight” in her arms. There’s a lot going on here. Janet embarks on a quest that is very much shaped by the social context in which she finds herself – an unmarried woman, an heiress to boot, in a patriarchal feudal society that prizes and polices virginity But the story is more than a document of political realities and a transgressive feminist heroine. Myths and folk tales are deep things. Jung saw them as portals into an inner collective psyche, and the Tam Lin story is veritably brimming with material for such an analysis: forbidden woods; defiance of authoritative father figures; devouring mother figures; the plucking of roses; alchemical personal transformations ending in redemption; the ubiquity of the color green. When Janet defies the king’s prohibition to ride –alone- to the forbidden woods of Carterhaugh, she is traveling to a wild, primal space that is outside – outside both the feudal social order, and outside the collective, masculine, rationalistic principle that rules much of outer public life (and which the king and the feudal order can be taken to symbolize). The woods are a portal to the deep, dark, fertile space of the unconscious. When she plucks the rose that has bloomed out of that fertile soil, Tam Lin, like a dream, also bubbles up from that space. The place of their encounter is a sort of borderland between the conscious world and the unconscious, and there ensues a bit of a border dispute between Janet and Tam Lin, both staking a claim. That dispute ends in a fruitful, if preliminary and not yet stable, exchange. Janet travels out of the world dominated by the overbearing, collective masculine (the king), who has segmented the world neatly into categories, rules, and status distinctions, into a world in which all those rules and categories are more or less suspended. Her initial trip to the fertile void (the woods) activates her own fertility: she leaves the woods pregnant. I think one of the most notable things about the story is its layers of reversals. The representative of the regimented, masculine outer world, a lone rider who exercises her free will to come invading the primal space of the woods, is a woman. The place-bound denizen of the dark, mysterious, pre-rational woods is a man. In a way, both individuals are being held captive by larger orders cast in extremes. The feudal order shows the dark side of the drive to reason, to categorize. The faerie world and the woods, meanwhile, are dangerous because they threaten regression, to the absence of distinctions altogether. In their union, Janet and Tam Lin free themselves from both extremes and move toward integration, toward appropriate distinctions, which moderate and manage -without oppressing or killing- the fertile, mysterious void. But for the story to get to that point, the point of integration, takes heroics on Janet’s part. Here, I think, is the real beauty of the story. The most striking thing about Janet is not so much her defiance of authority and convention, her bravery, or her commitment to true love, although all of these are present. Janet’s heroism is her particular combination of curiosity and responsibility. She has beauty, wealth, and status in the feudal order. But she ties her kirtle green and rides to Carterhaugh, a place dangerous as well as forbidden to her, and she does it for no real reason but to follow her curiosity. Janet wants to see and experience the woods; she wants to see and experience Tam Lin. She is fundamentally an explorer, of outer and inner worlds. To be curious and to explore is to not have a fixed goal in mind. It is to embody an openness that outer social orders and hierarchies of all kinds (feudal and otherwise) tend to find threatening. But curiosity is not just the absence of something; it is not mere empty space. Rather, it is spaciousness imbued with love: a caring sort of openness – cura, to care. Why bother to explore the world, after all, if one doesn’t care about it, in some way? To be sure, at a certain point in the story, Janet does acquire a goal, and she goes about seeking it in a tenacious and courageous fashion. She has the opportunity to paper over her the consequences of her actions, or to sweep them under the rug, by marrying one of her father’s knights, but she refuses. Instead, she chooses a much harder road, fraught with risk – and she stays that course. Tam Lin might have refused her; she might have met some danger along the way; she might not have succeeded in freeing him from the fairies; and even after doing so, she continues to risk the vengeance of the fairy queen. Her ordeal at Miles Cross is a stunning demonstration of her strength and groundedness: she must not only be physically strong, but also strong in her heart, as Tam Lin is transformed into fearsome creature after creature in her arms. She must literally contain him so that the process of transformation can complete. The deepest lesson of the story, to my mind, is that these moral qualities, curiosity and responsibility, twin aspects of strength, are required not only for our outer quests, but for the inner quest of psychological integration that is the human condition, as well. Janet teaches us that the inner journey really is a hero’s quest, requiring old-fashioned virtues of character that are ultimately born of will. Even here, we have choices, and responsibilities. Janet challenges and inspires us to take heart, no matter how fearsome the burning-hot brand of iron in our arms, or inside us, may look. I refer primarily to Child’s Ballad 39a, supposedly the earliest recorded version of the song. See http://www.tam-lin.org/front.html. Fairport version, for brevity (in substance, this verse is very similar to Version A recorded in Child’s Ballads). Posted in Bodies and Minds, Popular Fictions, The Wide, Wide World and tagged fairport convention, Fairy tales, Halloween, heroes quest, Jung, Tam Lin. Bookmark the permalink. Sanjukta Paul for Avidly’s first Halloween! This is completely excellent. Morgan Fahey, Jedediah Purdy, others invested in this story, and what Sanjukta has said over it the last couple of of years ( Elizabeth Hamilton)–check it out! also, I have never liked this song (blasphemy) but I listened to it about ten times in a row last night while formatting this piece, and am here to say that it is awesome. If you’re home today ( Jordan Stein), you might consider doing the same. Also, while I’m just tagging people here, I have been very curious to hear how people like Peter Coviello, Hester Blum, and Caleb Smith feel about the extravagences of Fairport Convention. Because, like, DAMN, right?